It wasn’t easy to avoid paying a fee to use the Columbia Turnpike — though many found creative ways. This was what West Gate looked like more than a century ago. This story begins in a restaurant in Stockbridge and ends at a vacant stone building in a cement quarry section of Greenport, New York, on the outskirts of Hudson, 35 miles away. Travel is in the imagination, triggered by the end of the toll plazas on the Massachusetts Turnpike and curiosity about early toll roads here, enlivened by a bit of research and decorated with new photos and old postcards. 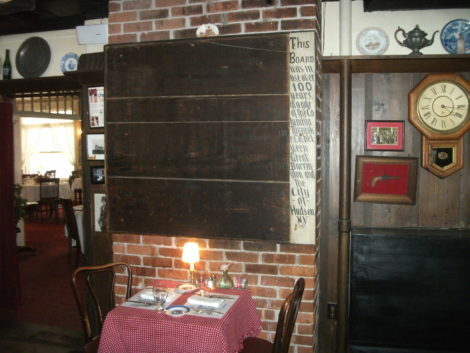 The eclectic décor of the Widow Bingham Tavern in the Red Lion Inn includes the original toll fee board that once hung at the eastern gatehouse of the Columbia Turnpike in nearby New York state, no doubt collected by earlier innkeeper Allen T. Treadway. The board’s lettering is darkened with age and is difficult to read. Next time you’re there, check it out while waiting for your food to arrive, and consider this. We take most of our modern highways for granted as free passages. The obvious exception is the Mass Pike, which initially linked Route 128 near Boston with the New York state border. With legislative authorization of the Massachusetts Turnpike Authority in 1952, William Callahan at the helm, the road was platted, dug, blasted, filled and leveled from 1955 to 1957. A Boston extension opened in 1964. Toll booths, the modern equivalent of the turnpike houses of an earlier era (after a toll was paid, a wheel was turned, raising the pike or gate to allow passage, thus the name), disappeared in 2016, replaced by windshield-mounted transponders and above-highway camera monitors. While few of us will miss the tollbooths–I snapped a photo of the one in Lee on its last day just as a reminder–it’s fascinating to learn that some two-centuries-old tollhouses are still intact. The Twelfth Massachusetts Turnpike, chartered in 1801 and in operation until 1857, came from the Connecticut border at Clayton along Polikoff Road through Ashley Falls (crossing the Housatonic River on a now-gone section of Pike Road) to Old Route 7 to Sheffield Plain and onto Egremont Road (once called Albany Turnpike) into South Egremont (Route 23) to the New York line. Tolls were collected at George Messenger’s house and Asahel P. Bennett’s in Sheffield. The Fifteenth Massachusetts Turnpike, chartered in 1803, ran from south Sandisfield toward Hartsville (the village in New Marlborough) then took Adsit Crosby Road (to avoid a particular hill) and joined the present Route 57 to run into Great Barrington. At Belcher Square it turned north along Route 7 and went to the southern boundary of Stockbridge, where it met the Stockbridge Turnpike. 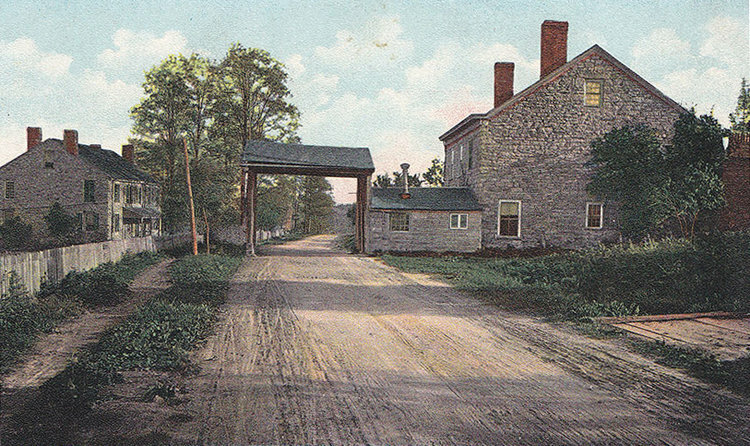 This toll road was given over to Berkshire County in 1829. This route didn’t go to New York state, but it linked with one that did. 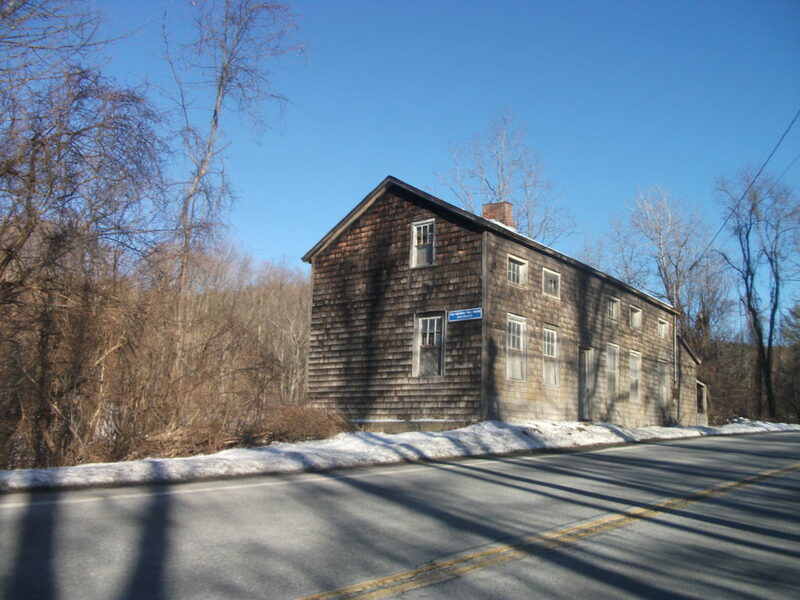 The Great Barrington-Alford Turnpike was chartered in 1811 and built in 1812-13, started at a junction the 15th Massachusetts Turnpike near Root Orchard at the foot of Monument Mountain in VanDeusenville. This was the original route of the highway from Stockbridge–you can still find parts of it on Monument Mountain Reservation. The dirt road that goes out toward Taft Farm is the old turnpike. 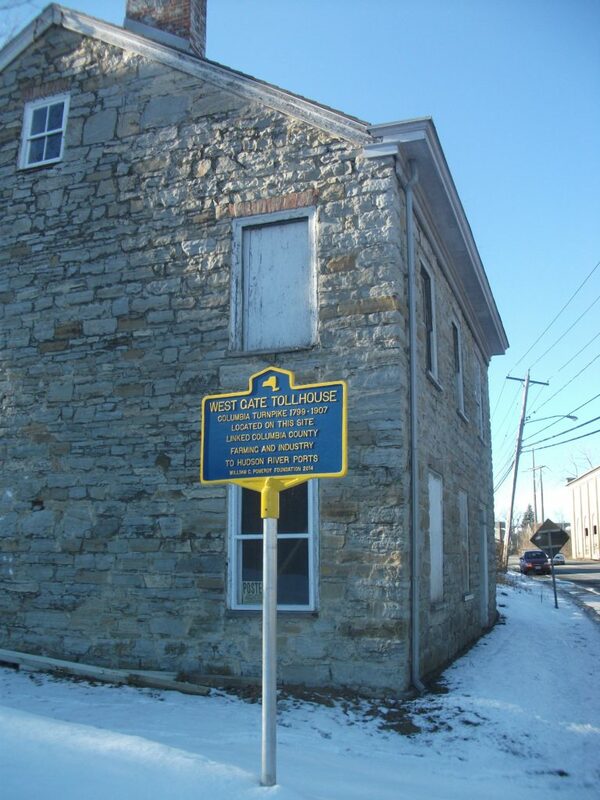 It followed Division Street west through Alford and Boice Road and Prospect Lake Road in North Egremont to the New York state line. There was a tollhouse just south of the town line between Alford and Egremont. Part in Great Barrington was made free in 1831, the rest in 1846. The Columbia Turnpike had a variety of rates depending on vehicle and number of horses, or types of livestock. The 12th and the GB-Alford pikes went to the New York border to join the Columbia Turnpike. the longest in distance and viability in the region. The Columbia met the Massachusetts 12th at the top of Molasses Hill in South Egremont. It continued from Hillsdale to Craryville (also known as Bain’s Corners), Martindale, Hollowville (or Smokey Hollow), Red Mills and Claverack. The toll road from there followed what is now Route 23A through Greenport to Hudson. The roadway had a 50-foot right-of-way, the road surface sufficiently wide enough that wagons could pass each other going in opposite directions. The center of the road was beveled slightly so water would run off. Farmers traveled it with their wool, rye, wheat, butter, pork, cheese and other goods. The Miller stagecoach ran a regular route on the road. There were a half dozen hotels spread across the length of the road. Once a toll was collected, the East Gate keeper raised the ‘pike’ beneath the porte-cochére to allow passage of carriages or wagons. There was relief for Sunday church attendees and for those going to funerals. Farmers could take grain to the grist mill at no charge. Hours were 9 a.m. to 9 p.m. The tollhouses had porte-cochéres. A dangling ladder-like gate was raised after a toll was collected. Some horse riders avoided paying tolls by racing through the gate, raised for a paying customer, before it could descend. There’s still a Shunpike Road, which links Prospect Lake Road and Oxbow Road in Egremont with Mitchell Road in Hillsdale, and from Mitchell Road joins the toll road west of East Gate, beyond reach of the toll taker. Businesses on the toll road enjoyed advantages. The Hartford Courant for April 5, 1809, for instance, advertised for sale “a Public House, on the Columbia turnpike road, 2 miles from the court-house, in the city of Hudson, county of Columbia, and state of New York.” Also on the property was a gin distillery. 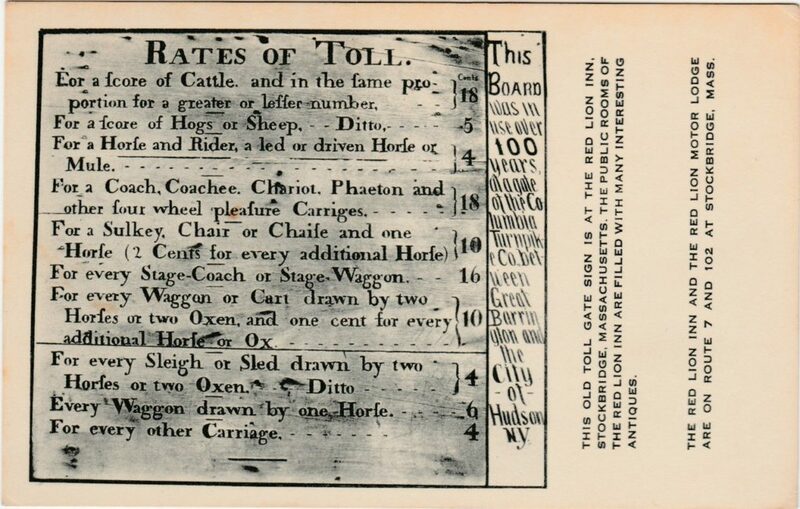 In 1835, the toll road saw particularly heavy traffic as heavy wagons carried Sheffield marble from Chester Goodale’s quarry to the port of Hudson for shipment to Philadelphia for construction of Girard College. Few private turnpikes brought their owners profit save the tavern keepers at either end or along the way. Competition soon included the Berkshire Railroad, which continued the Housatonic line from North Canaan through Sheffield and Great Barrington to West Stockbridge to connect with the West Stockbridge Railroad to Hudson in 1842. The Housatonic leased the Berkshire Railroad tracks in 1843. Because these lines bypassed Stockbridge, Lee and Lenox, the Stockbridge & Pittsfield Railroad incorporated in 1847 to go from VanDeusenville to Pittsfield through those towns. The line opened in 1850 and was immediately leased to the Housatonic Railroad. 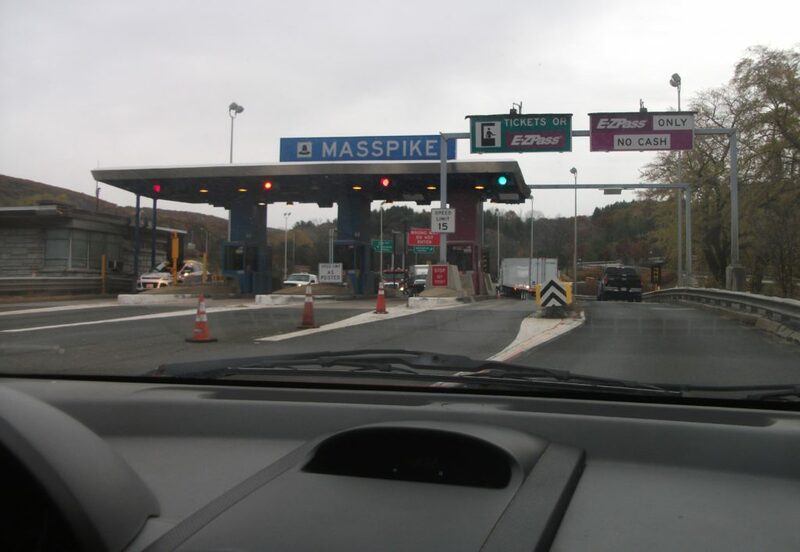 The railroads spelled doom for any remaining Berkshire toll roads. The Columbia Turnpike, remarkably, was an exception: It lasted into the 20th century. Construction in 1852 of the New York & Harlem Railroad that passed through Hillsdale on its way to Chatham (to join the Albany & Western Railroad and link with Albany) took some of the oomph out of Columbia Turnpike profits. And as time went on, the turnpike corporation deferred maintenance, raising the ire of residents in the late 1870s. The Columbia County Board of Supervisors paved portions of the highway in 1906 and, the next year, purchased the corporation’s assets. Passage was now free. 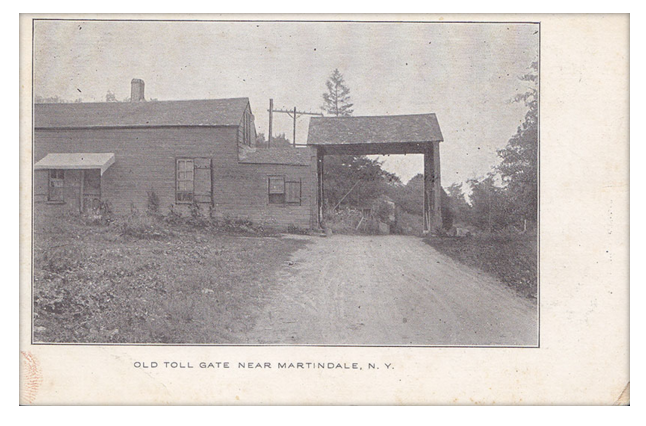 Middle Gate, now gone, was near the entrance ramp to the Taconic Parkway in Martindale, New York, west of Hillsdale. These toll roads still exist, disguised under decades of new gravel and pavement. You can travel from Stockbridge to Hudson on the old roadways, with a few deviations. A surprise is that you can still see Columbia Turnpike’s eastern and western gatehouses. The two-story, woodframe, Federal-style East Gate in Hillsdale, on the National Register of Historic Places since 2016, was built in 1799. The building, after 1907, became a private residence until 1990. Friends of East Gate acquired the building in 2017. Middle Gate, also known as Hoffman’s Gate, another woodframe building, is gone. It was in Martindale, in the vicinity of the Chief Martindale (formerly Taghkanic) Diner and Taconic Parkway (1925) entrance ramp. And that’s the story, no charge. Bernard: Thanks for your very informative article about early toll roads. 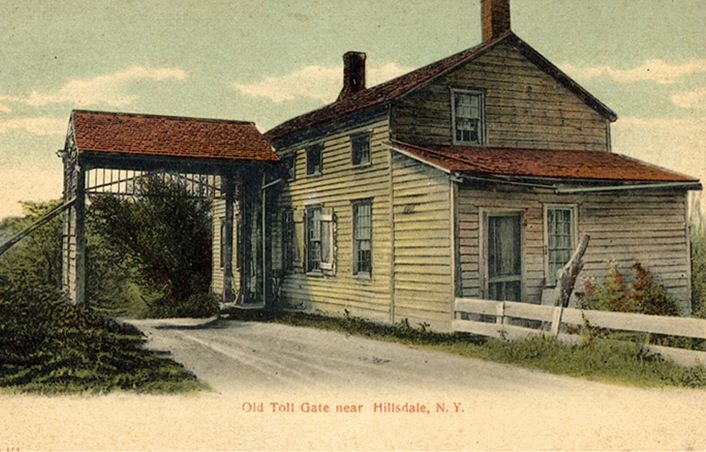 Regarding the East Gate Toll House on Route 23 in Hillsdale, while the Columbia Turnpike was chartered in 1799, the current East Gate Toll House was likely built sometime between 1805-1825. There was a predecessor toll house, probably not on the same spot, before the current building and it’s possible it was built in 1799 but we don’t know for sure. The Friends of East Gate hope that a building condition report, including an analysis of the wood used in construction, will more accurately establish the East Gate Toll House’s date of construction.